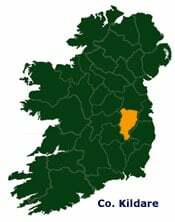 Bordering Dublin to the west, the inland county of Kildare is situated on the edge of the country’s central plain. Kildare is a county of open grasslands, lush green pastures and large tracts of ancient bogland, interspersed with trees and gently rolling hills. Kildare is famous as a sporting, racing and hunting region. Racing at the Curragh, Punchestown and Naas takes place all year round, boasting some of the biggest meetings in the country’s racing calendar, including the Irish Derby in June. Near Kildare town, the Irish National Stud and neighboring Japanese Gardens, said by experts to be the best of their kind in Europe, are attractions well worth visiting. Both were founded at the turn of the last century by Colonel Hall Walker of Johnnie Walker whiskey.